We offer illustrated talks, concerts and workshops covering many aspects of the National Curriculum with musical styles ranging from classical to traditional folk, blues, ragtime and swing. A variety of instruments are featured including the unusual family of mandolin instruments (*mandolin, mandola, mandocello and mandobass), violin, guitar, banjo and double bass. Areas covered include songwriting, composing, arranging, recording, music in the media, music for dance. 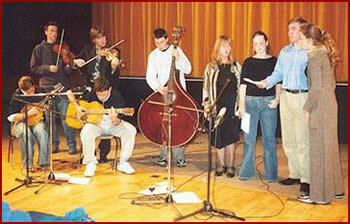 In addition we can take groups for instrumental and vocal workshops leading to a joint performance. Time required for workshops depends on students ability and the amount of advance preparation. Arrangements can be supplied in advance. We cover our musical backgrounds, sources, live performance techniques, the recording studio, the media, composing, lyric writing, arranging and ensemble playing.The music we use is drawn from our 'adult' repertoire. If we are incorporating a daytime visit with an evening concert, we can involve some of the more musical students on a couple of pieces. We can send arrangements in advance and would need to spend an extra session (length of time depends on advance preparation and ability) with the group. 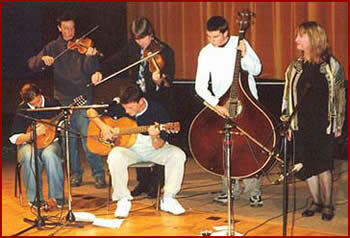 Musical styles range from baroque to classical, traditional folk, blues, ragtime and swing. We introduce a variety of instruments: the mandolin family (mandolin, mandola madocello and mandobass), violin, guitar, banjo and double bass. If you would like to check availability and discuss a visit to your school please contact us. the pupils before this public concert in the evening. 'Down By The Salley Gardens'.